Nutrient requirements in young trees increase annually during fruit formation. This study was conducted to determine the effect of fertilisation treatments, using fertigation, on the vegetative and reproductive growth of young cherry trees (Prunus avium) cv. 'Brooks' grafted onto 'MaxMa 14' rootstocks in Central Chile. The research was conducted at the La Palma Experimental Station in Quillota on 3-yr-old cherry trees spaced at 5 m x 2 m and trained as central leaders with the Solaxe system over the course of two growing seasons. Few of the measured variables were significantly affected by the treatments. The shoot length was affected only after harvest (November), the node number increased with shorter shoots, and the fruit set decreased with no N application. Fertilisation resulted in some negative effects, such as a lower number of nodes (per m-1), decreased fruit set, and increased cracking. 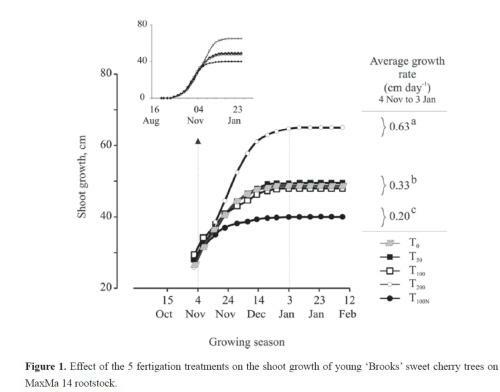 Considering the null effect of applying N before harvest and the significant difference in vegetative growth between T100 and T200 after harvest, it appears that there are at least two different strategies for the fertilisation of young cherry trees: fertilisation should start either after harvest or a few weeks earlier with N applications higher than 100 but lower than 200 kg-N ha-1. This amount should be further investigated, and a combined strategy of less than 200 kg-N ha-1 plus accompanying nutrients applied after harvest should be used. The nutrient requirements of young cherry trees (Prunus avium L.) increase during the period of fruit formation, and they continue to increase annually until the trees reach full production. In addition, the nutrient requirements can vary according to training systems, planting density, soil type, climatic conditions and other factors. The availability of nitrogen (N) is one of the crucial aspects of orchard management. The estimated requirements in the first six years range from 8.8 to 44 kg N ha-1year-1 for pommes and stone fruit trees (Dierend, 2006; Neilsenand Neilsen, 2002), while for adult trees, they range from 39 to 65 kg N ha-1 year-1 (Roversiand Mon-teforte, 2006). Excess N during the last phase of the annual growth period results in fewer leaves, decreased flowering density, fewer flowers per bud, decreased fruit set and lower yield (Lindhard and Hansen, 1997). Nitrogen excess, although seldom toxic, can cause leaf-yellowing and shoot and tissue death (Agusti, 2004; Coleto, 1995), or it can encourage a too vigorous vegetative growth, lower rates of growth and ripening in fruit, and shorter post-harvest life (Gil, 2000, Hanson and Proebsting, 1996). Experimental results from apple orchards show that N applications before flowering are ineffective. N from the tree reserves at this time is sufficient to meet the requirements at the beginning of the growing season; therefore, it is only after this process has ended that the rapid absorption through the root system begins (Neilsen and Neilsen, 2002). Inadequate dosages and improper timing of N fertiliser application can cause serious negative effects, not only on the trees and fruit but also on the environment, if excess fertiliser is leached out of the soil and reaches local water sources (Domínguez, 1993; Auazo et al, 2006). For most crops, the amount of available water results in differential effects on both vegetative and reproductive growth. The expansion of the shoots and young branches increases with the amount of water applied. Conversely, while vegetative growth decreases, foliar abscission increases when the water deficit reaches 50% of ETc (Livellara et al., 2011). Yield is not affected by moderate water deficit (0.75 ETc), although the fruit size decreases (Dehghanisanijet al., 2007, Neilsenet al., 2004). Previous studies on cherry fertigation show that the optimisation of water and nutrient applications is possible. The highest efficiency is obtained with low N applications (50 mg-N L-1) between 0 and 8 weeks after flowering together with irrigation programmed according to the evaporative demand (Hanson and Proebsting, 1996). Leaf N concentration, however, decreases when the total salinity of fertigation solutions exceeds 4 mM (Sotiropoulos et al., 2006). Appropriate applications of water and nutrients allow the temporal adjustment of fertigation requirements according to the phenological state, age and health of the plants, as well as providing an efficient use of water and the reduction of pollution (Neilsen and Neilsen, 2002; Domínguez, 1993). Climatic conditions, particularly chilling accumulation in winter and temperature and relative humidity in spring, affect shoot growth, flowering and fruit set, as well as the fruit growth and ripening rate (Alburquerque et al., 2008). Soil conditions affect local nutrient availability, particularly for micronutrients, the air/water balance, and root formation capacity, among other factors. Considering that many nutrient uptake studies have been conducted under significantly different climatic conditions from Central Chile, there is a need for local experimentation. 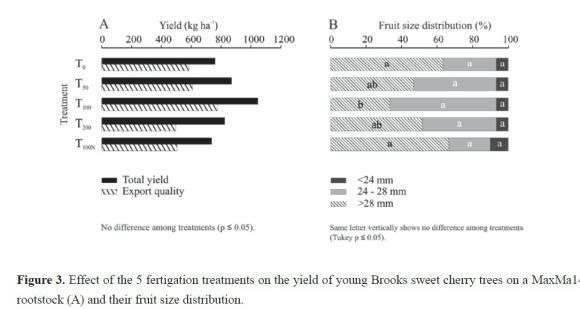 The objective of this study was to determine the effects of nutrient solution applications (by fertigation) on the vegetative growth and reproductive behaviour of young 'Brooks' sweet cherry trees grafted onto a 'MaxMa 14' rootstock (Prunus aviumL.) grown in Central Chile. The experiment was conducted in a cherry orchard that was planted in 2003 at the La Palma Experimental Station1 located in Quillota, Central Chile, during the 2004/2005 and 2005/2006 growing seasons. The area has a marine Mediterranean climate with 339 mm of rainfall annually occurring between March and November, a 15.3Â°C average annual temperature, and an853 mm average annual potential evapotranspiration (ET0). The temperature reaches 27Â°C in January (mid-summer) and 5.5Â°C in July (mid-winter). The degree-day accumulation is 3700 (base 5Â°C) and 1 900 (base 10Â°C), while the winter chilling accumulation reaches only 500 hours between March and November (Novoa et al., 1989). The soil is Inceptisol in type and colluvial in origin, with three layers. The first layer is clay loam in texture (to a depth of 50 cm), the second is sandy loam (between 50 and 80 cm), and the third is clay (between 80 and 100 cm). The soil profile depth varies between 80 and 100 cm. The volumetric moisture content (v/v) at field capacity (θFC) is 0.26, 0.38 and 0.30 at 30, 60 and 90 cm depths, respectively, while the volumetric moisture content (θv/v) at the permanent wilting point (θPWP) at the same depths is 0.11, 0.15 and 0.13, respectively (Livellara et al., 2011). The orchard used in the study was planted in 2003 with 3-year-old ' Brooks' cherries grafted on a 'Max-Ma 14' rootstock spaced at 5 m x 2 m and trained as Central leaders with the Solaxe system. Each experimental unit consisted of three plants occupying an area of 30 m2. As 5 treatment and 3 replicates were used, the area of each treatment was 90 m2 plus borders, totalling 450 m2 plus borders for the experimental site, within a 1hectare orchard. The orchard was managed using standard commercial practices for sweet cherry production (Ellenaet al., 2006; Livellara et al., 2011). Irrigation was applied from August to November of each season, three days per weekwith watering of the soil with 100% of the crop evapotranspiration (ETc). The ETc was estimated with the Penman-Monteith method for ET0 using data from an automated weather station, monthly adjusted with the corresponding crop coefficient (Kc) (Allen et al., 1998) and shade factor (Fs) (Vermeiren and Jobling, 1986). Irrigation took place at night once the volumetric soil humidity (9) between 20 and 60 cm deep fell to 0.75 of field capacity (FC). The irrigation system was designed intwo parallel lines, 60cm from the tree row on either side, and 8 drippers/plant (4 L h-1 each), which were 50cm apart along the lines (Livellara et al., 2011).Nutrients were applied through the irrigation system during the whole irrigation period in a constant proportion. For the second growing season under study (2005/2006), the irrigation water applied totalled 394 mm. 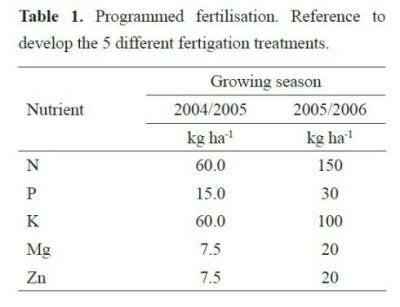 Five different nutrient treatments were applied (Table 1): T0 - control (no fertiliser); T50 -50% of the programmed fertilisation; T100 -100% of the programmed fertilisation; T200 -200% of the programmed fertilisation and, T100N -only N equivalent to 100% of the programmed fertilisation. The field experiment was set up using a randomised complete block design with 5 treatments and 3 replicates. To assess the effects of nutrient treatments on vegetative growth, four branches were randomly chosen and marked for measuring length (weekly), basal diameter (monthly) and the number of leaves (counted once during the growing season). The trunk diameter was measured monthly at 15 cm above the graft union. Reproductive growth was evaluated with the same four marked branches used for vegetative measurements by measuring the following: the flowering rate (number of flowers/ branch, counted daily between 25 to 29 August), the fruit set number (once during the growing season after drop) and total yield per tree (postharvest). The number of spurs was determined at the beginning and at the end of the growing season. The fruit quality was evaluated by measuring soluble solids (Â°B) and by the percentage of fruit with cracking and/or bird damage (%) in random samples of 25 cherries/tree from whole trees. Leaf samples of 10 mature leaves per tree, from the middle third of the corresponding branches, with no visible disease symptoms, were taken for nutrient analysis just before leaf-yellowing at the end of the second growing season (2005/2006). Only a few of the measured variables were significantly affected by the nutrient treatments. The shoot length showed differences only after harvest (8 to 22of November 2005); whereas it was not affected by the amount of N applied through fertigation from the start of shoot growth (August) to harvest (November) (Figure 1). The shoots of the high fertiliser treatment T200 grew significantly longer than the others between harvest and the end of the growing season (March); however, no differences were found among the T0, T50 or T100 treatments. T100N had the lowest cumulative length (Figure 1), while the mean growth rate for the most rapid period of growth (November 4 to January 3, approximately) showed a ratio of 1.0 : 1.5 : 3.0 for (T100N) : (average T0, T50, T100) : (T200) respectively. These results indicate that, first, there are no measurable effects of the fertiliser applications before harvest, which is in accord with Neilsen et al. (1998). Second, after harvest, the application of N100 without other nutrients (P, K, Mg, Zn) in the fertigation solution results in only one-third of the vegetative growth of the higher rate treatment (T200) and two-thirds with respect to the other treatments, including the unfertilised treatment (T0). This effect of the lack of other important nutrients provokes physiological imbalance. Another remarkable result is that the 60 or 150 kg ha-1 of N (T100, depending on the growing season) was not enough to increase growth with respect to the unfertilised treatment (T0), which is also in agreement with the results of Neilsenet al. (1998). These last two variables, however, were less relevant, as the trees were still very young (1 to 2 years) and had only just started to produce a small amount of fruit. Considering the null effect of fertilisation before harvest and the significant difference in vegetative growth rates between T100 and T200 after harvest, it seems that there are at least two different strategies for the fertilisation of young cherry trees: either fertilisation should begin after harvest or a few weeks earlier, or the N application rate should be higher than 100 but lower than 200 kg ha-1, although this rate should be further investigated and refined. Finally, perhaps the best results would be obtained with a combined strategy of using less than 200 N kg ha-1in addition to accompanying nutrients applied after harvest. This study is part of the project funded by FONDEF D021-1030, National Commission for Scientific and Technological Research, Government of Chile.